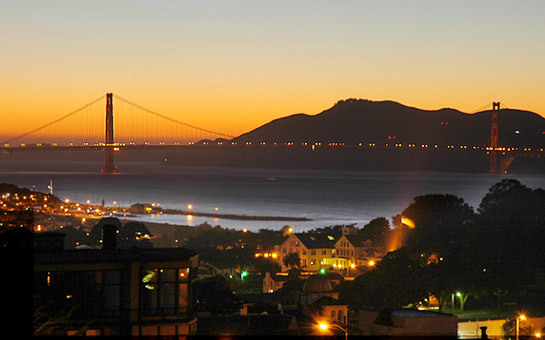 A spacious contemporary condominium in a three-unit building located on the flat block of Chestnut on Russian Hill with unobstructed, sweeping views of the Bay, Golden Gate Bridge, Alcatraz, Aquatic Park, Angel Island and Fisherman's Wharf. Within one block of the Hyde Street cable car, enjoy easy access to the City's best sites, shopping, dining & entertainment. Beautiful dark stained parquet and hardwood floors, crown molding and recessed or spot track lighting are found throughout the flat. The hall and several rooms contain custom lighted ledges and niches for small art objects or artwork. Built-in bookshelves abound. Enter the Main Hall to the inviting LIVING ROOM with banker's green marble fireplace and expansive view terrace. The changing colors of the sea and sky provide an impressive backdrop to the City's famous landmarks. The cozy LIBRARY/DINING ROOM features a built-in entertainment system and a bank of built-in book shelves. It adjoins the breakfast area and open KITCHEN which contains ample granite counter space and cabinets. Appliances include: Sub-Zero refrigerator/freezer, Dacor gas cooktop and side-by-side ovens, microwave, ventilator, dishwasher, disposal and washer/dryer. The bedrooms are conveniently separated from the public rooms for solitude and privacy. The spacious and sunny MASTER BEDROOM contains a wall of mirrored closets, ceiling fan and houses a built-in television set. The bay windows with plantation shutters overlook Chestnut Street. A walk-in closet adjoins. The luxurious MASTER BATH features an all marble & mirrored surround, wide vanity, toilet and bidet. The large double shower is open to the spa tub. The second BEDROOM also looks on to Chestnut Street and contains built-in bookcases with an optional desk attachment on one wall, art niches on the opposite wall and a ceiling fan. The third BEDROOM located in the middle of the floor plan can also serve as a cozy study with its many built-in book shelves. The two bedrooms share a tiled BATHROOM with pedestal sink & large shower. Television & stereo system with in-ceiling speakers in several rooms convey with sale. Plantation shutters in kitchen & bedrooms. One parking space in tandem in the garage & automatic garage door opener. Elevator exists in the building. Potential elevator access, reference 2nd Amendment to Amended & Restated CC&Rs, Section 4.8(a). Current HOA dues are $350 paid monthly. Annual $1,800 insurance assessment. With the exception of kitchen and bathroom areas, 75% or more of the floor areas of each room and hallway located directly above any other unit shall be covered with carpeting.